Around 4 am every morning, I hear the first birdsong of the day outside my bedroom window. Man, those suckers like to get an early start! Most days when I hear their bright, bold melodies my heart sings along as I try to drift back to sleep. This birdsong captures the season of Gemini so well—the airy, lilting song that beckons the world to wake up and be glad. Gemini, the sign of the Twins, holds a mirror up for us. What we see in that mirror is simply what we have to show. Our experiences, hopes, dreams, and thoughts become the songs that fill the Spring morning. Though not everything in the mirror is always bright and happy—each of us holds pain there too—we have the opportunity this season to notice just what is showing up. Brightness, sadness, stress, or fear, everything is meaningful and can be understood in a deeper way when we take the time to be mindful. The lunar month that began on May 20th in Gemini, comes to an end this week. Usually, the next new Moon would be in the next sign of the zodiac, Cancer. This year, however, we get another Gemini New Moon. Think of this as a bonus from the stars. This past lunar cycle saw a solar eclipse in Gemini, the rare and beautiful transit of Venus retrograding in Gemini, and the ingress of Jupiter into Gemini for a year-long journey. Something is up. Gemini is ruled by Mercury, known in Greek myth as Hermes. This god has many roles. One of them is the herald. The infusion of Gemini into the world this past month can be framed as a message about the changes that are coming our way. Most notably next week Uranus in Aries and Pluto in Capricorn perfect their first of seven squares that will occur over the next three years. If this is a signal of The Great Turning, as Joanna Macy calls it, how does Gemini teach us to weather this shift? How does Gemini model the things that are helpful and not so helpful about embracing change with mindfulness and intention? How can we greet this dawning with our own heartsongs? Sunday, June 17. Moon in Gemini stirs up the unsettled mutable energy that marks this lunar cycle. Yet, we are in the balsamic phase of the Moon and that means we have the capacity to apply a greater sense of wisdom to the jittery nerves that can come from too much Gemini. Sometimes what we love about a sign, gives us the ability to see beyond its challenges. I love Gemini’s youthfulness, curiosity, and optimism. These qualities help me to embrace possibility. As you reflect on the meaning and value of this lunar cycle, what have you noticed about the expression of Gemini in your life? Monday, June 18. This last day of this lunar cycle may challenge our intentions. The Moon in Gemini squares Mars in Virgo at the same time that it trines Saturn. The Saturn aspect supports staying grounded and focused today; the Mars aspect gives us a short fuse. Mars has almost reached the exact degree where it turned retrograde in January (exact tomorrow on the new Moon). Since November 2011, when Mars entered Virgo for an extended retrograde stay, we’ve been challenged to apply our wills to the Virgo values of service, work, and discernment. At times, this has felt like indentured servitude, at other times like productive application of our energy. Have you noticed a greater expectation for perfection within and around you? How has this pushed you to make changes in your life? The relationship between Gemini and Virgo can be a stressful one, but these signs encourage us to integrate both mind and body. When we pay attention, we are able to feel the holistic relationship between these two parts of ourselves and achieve greater wellbeing. June 19—New Moon: Dreaming. One more seed to plant in Gemini’s soil and then the Sun moves into Cancer tomorrow for the Summer Solstice. During this month, I’ve notice how mutable my own emotions are, changing not only day to day but sometimes minute to minute. If emotions are like summer clouds, is it necessary to attach so much significance to them? Perhaps this awareness can help us step consciously and joyously through this summer season. 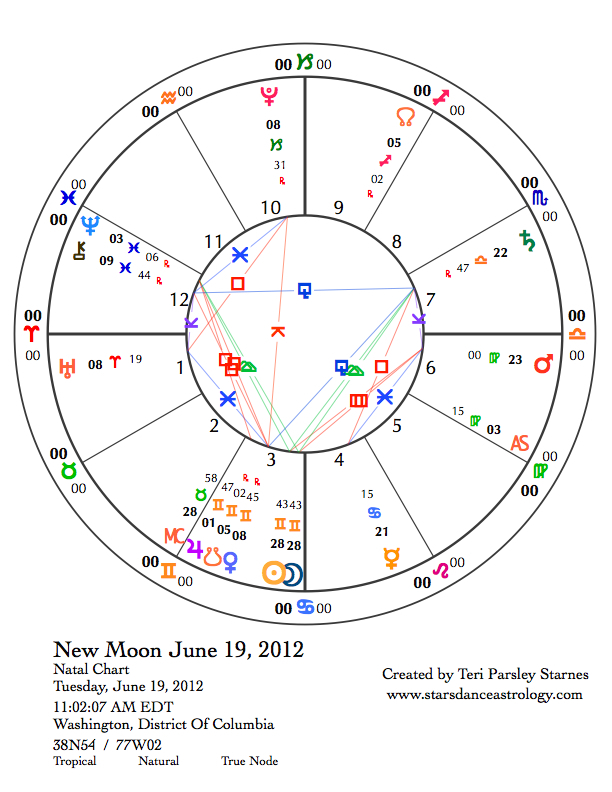 The New Moon chart shows the drama of this season. Pluto and Uranus are squared at 8 degrees of Capricorn and Aries. All indications say this is a time of big change and transformation. Mars at the degree of its station in January is square to the Sun and Moon in Gemini. Breath, exercise, eating well—all these are tools to help with stress. What helps you under the stress of high expectations and a rapidly changing world? Neptune in Pisces is square to Jupiter in Gemini—when overwhelmed, do you just want to check out sometimes? Everyone needs to escape from time to time, but notice when this is happening to you. Perhaps this is an indication that you can also choose to meet this new world with greater compassion and connection, not just in the human realm but with all beings. Chiron, the shaman and healer, is square to Venus—perhaps it is time to make sure our relationships serve our spiritual journeys and that our spiritual journeys serve our relationships. In addition, there is an interesting configuration that emphasizes Saturn in Libra. This is a triangle of Venus square Chiron with each of these being sesquiquadrate to Saturn. Forget the crazy word, this means that there are some important adjustments going on around the theme of balance. We all need it, desperately and we have to work for it. Saturn wants us to focus and invites us to the balance between distractions and intentions. To add just one more stressful aspect, because of course everyone wants to play this month, Mercury is square to Saturn. We have the urge to make our words matter. The conversation could very well be about security and taking care of hearth and home. The Dreaming phase of this lunar cycle lasts four days this time. Since so much is going on energetically, we may want to take a couple of days to reflect and notice our true hearts’ desires and needs before setting intention for this month. Another option is to engage in a spiritual practice that helps us stay grounded, aware, and flexible as the challenges of this month unfold. Wednesday, June 20. Summer Solstice happens at 7:08 pm EDT today. The chart for the solstice describes influential energy for the entire summer season. 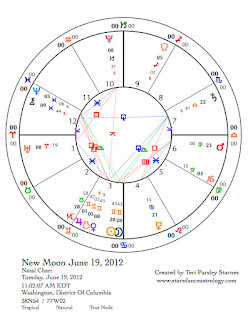 Much of the aspects described in the new Moon chart apply for the whole season. We celebrate the strength of the Sun on this day and acknowledge that now the Sun’s rays begin to diminish here in the Northern Hemisphere. The sign of Cancer reminds us of the importance of nurturing self and beloveds. We take comfort in our familial connections. After the expansiveness of Gemini’s season, we need a chance to relax and recharge. Thursday, June 21. How important is your home to your wellbeing? Today, notice how you feel about your home. The Moon makes supportive aspects to Mars, helping us to take action to improve our surroundings. Mercury aids communication. Watch out for feelings of hopelessness, even small acts can make a difference. Friday, June 22. The Moon in Leo encourages us to let our light shine. Leo helps us to know our gifts and invites us to the playground where we explore, develop, and share those gifts. June 23—Crescent Moon: Beginning. The Moon remains in Leo today. Creativity helps us begin something new. Dare to know that you are important and gifted. Allow the strength of the Summer Sun to fill you and bless you in this journey. Follow the Moon: June 24, 2012 - June 30.